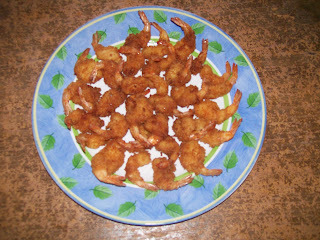 Tempura Shrimp (Udang Tempura) is very easy and quickly made. Very good served directly after cooking, because it will taste crunchy. Can be eaten with rice or for a snack. Serve with tomato sauce, chili sauce or mayonnaise, just choose what you like. 7 tablespoons tempura flour, can be purchased at the supermarket. Tomato sauce / chili sauce. 1. Clean the shrimp, remove the head and skin, reserving its tail. Cut back. 2. Enter into the flour, lift. 3. Dip into the mixed egg, lift. 4. Enter into bread flour (tepung tempura), lift. 5. Heat oil and fry the shrimp until golden brown. 6. Remove and serve with tomato ketchup / sauce while warm. Note: If you want served to eat in the morning before go to office or school, to save time, you can do this cooking adventures guide no. 1-4 today, after that enter into freezer. Tomorrow morning, stay out of direct freezer and fried , very practical.